The Snooper S6-R neo GPS, Laser and Radar speed camera detector is one of the only systems on the market to combine all three technologies. Providing alerts to fixed cameras and mobile laser and radar based speed camera vans and handheld devices. The Snooper S6-R neo displays current speed, direction of travel and the speed limit and road number or name at each and every location detected (Except those detected purely by radar or laser). Snooper S6-R neo has been discontinued. Accessories are still available for your Snooper S6-R neo click here. The Snooper S6-R neo utilises the latest GPS, Laser and Radar technology one of the only units on the market to combine all three technologies. The Snooper S6-R neo speed camera detector compares your vehicles position using the GPS antenna included, with the position of every known fixed and mobile speed monitoring system and accident 'hotspot,' alerting audibly and visually via a speaker and the large LCD display. The information that the Snooper S6-R neo can provide is further enhanced by many user selectable features. The LCD display can be programmed simply and easily through a Full Logic menu system to show your current speed, direction of travel and the speed limit and road number or name at each and every location detected (except those detected purely by radar or laser). The Snooper S6-R neo is also equipped with a user selectable speed limit alert system so that the device can be programmed to alert you to any pre-determined speed you choose. Acting as a constant reminder of the current speed limit. The Snooper S6-R neo also comes complete with a radar/laser detector (S100RLD) that can either be mounted on the dashboard or inside of the windscreen. The Snooper S6-R radar/laser detector however is also waterproof and comes complete with an under bonnet mounting kit so that it can be positioned within the engine compartment behind the vehicles grille for a neat and professional installation. The Snooper S6-R RLD has been designed to detect all types of radar and laser speed monitoring systems often used in danger spots where 'Fixed' systems cannot be easily utilised, thus ensuring that you will be made alert to nearly every speed monitoring system and accident hotspot whether Fixed or Mobile. Detection of radar and laser is also selectable so that the device can be programmed to detect radar and laser, laser only or can even be turned off in low risk areas. The Snooper Snooper S6-R neo uses AURA, the most comprehensive speed camera database available offering alert to speed camera locations in the United Kingdom and Republic of Ireland. As new speed cameras are installed, they appear live on the AURA database within 48 hours offering you the ability to download new speed camera data seconds after it has been recorded in the database. The Snooper S6-R neo speed camera detector comes complete with a highly innovative built-in modem so that you can simply plug the device into any compatible telephone socket and download the database in a matter of minutes. To ensure that your Snooper S6-R neo is always effective, downloads can be performed as often as the user prefers. The Snooper S6-R neo includes LCD screen Control Panel, GPS antenna and S100RLD module (Radar/Laser detector) and can be temporarily or permanently installed. Temporary installation - you can mount the S6R-neo Control Panel and S100RLD onto your vehicles windscreen with the suction cup brackets (included). Permanent installation - you can mount the S6-R neo Control Panel anywhere on your vehicles dashboard or centre console (provided you have a sufficiently flat area) with the provided mounting bracket. The S100RLD module can then be mounted within the engine compartment using the mounting bracket included. With both installations the GPS antenna can be mounted on the dashboard or rear parcel shelf. Snooper S6-R neo uses AURA, the most comprehensive speed camera database available offering you the ability to download new speed camera data seconds after it has been recorded in the database. Simply connect the Snooper S6-R neo to a telephone line and this concise database can be downloaded in a matter of minutes! The Snooepr S6-R neo provides alerts to speed cameras fixed and mobile in the UK and Republic of Ireland. Want to add accessories to your Snooper S6 or S6-R neo? We sell a vast selection of genuine Snooper parts and accessories. Question: I have the chance of getting a snooper S6-R neo... I'm not an expert in this, but would like to get some sort of cover. To be honest had two tickets from the Go-Safe camera vans, (55kph in a 50km zone), in my Toyota Yaris. The interest I have is in radar/laser, and a bonus is the GPS stuff. Is it possible to get updates for the Snooper S6-R neo and is it something I can order from Active GPS. Answer: The Snooper S6-R neo was discontinued by the manufacturer 10+ years ago. You will need to contact the manufacturer to ask whether they still sell updates and support this old product. 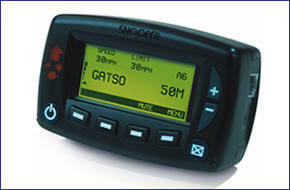 For the latest GPS, radar and laser detector please see Snooper 4ZERO Elite BT. In addition, you might like to take this into account - subscription charges of £29.99 applied for the Snooper S6-R neo, subscription charges are FREE with the Snooper 4ZERO Elite BT. Do you have a question about the Snooper S6-R neo? Submit your question via our contact page.